Ad Astra is the fourth Spiritual Beggars album and the last to feature original singer Christian “Spice” Sjostrand. It is a fitting final album for him that sets the standard in terms of his own performance and that of his band mates which have all improved leaps and bounds in the time since their debut album, Spiritual Beggars, was release in 1994. There is no build up or easing off with Ad Astra. Spiritual Beggars go in at full throttle and after the third song, Sedated, you’re already half expecting the group to throw in a ballad but we’re in luck – there aren’t any. Ad Astra is almost an entire hour of face melting guitar riffs, authoritative percussive blows, dense bass and lively keyboard work to fill in any semblance of quiet. The first parts of Until the Morning and Mantra would have you thinking otherwise before you get floored by brooding doom metal force on the former and flashy solo work on the latter. Given that Spiritual Beggars don’t slow down on Ad Astra and focus primarily on the guitar, it is hard to call it sonically diverse. What they lack in this department is more than made up for with their finely honed song-writing skills and stunning musicianship that will blow your mind straight out the back of your head. 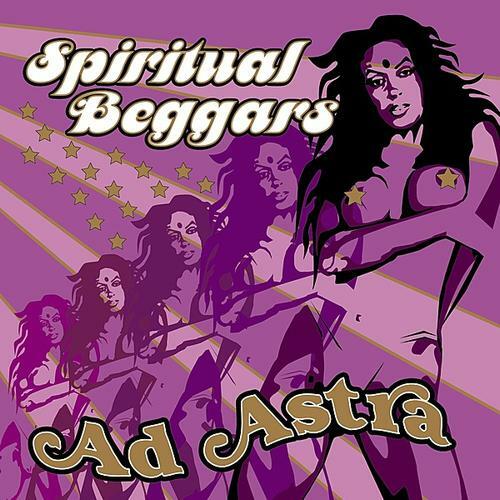 Ad Astra is a staple of the Spiritual Beggars discography with the single-minded, full throttle approach to the song-writing actually being the Spiritual Beggars greatest asset that doesn’t fail them for a single moment.